A compressor can be used to reduce dynamic range, maintain consistent levels, and shape the tone and character of a vocal track. Nectar 3 includes two Compressor modules that can be placed in series within the module chain, allowing for a variety of vocal compression configurations. The Compressor modules include controls for adjusting the amount, speed, and character of processing and robust metering for visualizing the effect of processing. The image below outlines the controls and meters available in both of the Compressor modules. Determines the processing algorithm used by the Compressor. There are four unique mode options available: Digital, Vintage, Optical, and Solid-state. The Mode selection influences the character of compression and will also determine the ranges of the Ratio, Attack, and Release controls. The following table describes the sonic characteristics and associated control ranges for each of the compressor modes. Ideal for achieving precise, clean sounding linear compression with minimal coloration. Emulates the program-dependent response and non-linear release characteristics of classic analog compressors. Smooth and transparent compression with subtle coloration. Emulates the subtle harmonic coloration and non-linear attack and release characteristics of classic hardware optical compressors. Note: Ratio is fixed to 4:1 when Optical mode is selected. Use RMS level detection mode (rather than Peak level detection) to more faithfully emulate the sound of hardware optical compressors, which utilized RMS level detection. Clear but aggressive compression with unique harmonic coloration. Emulates the fast attack, non-linear release times and harmonic characteristics of early VCA transistor-based hardware compressors. Solid-state mode can be useful for accentuating vocal transients. Use Peak level detection mode (rather than RMS level detection mode) to best highlight the pleasing harmonic coloration effect of the Solid-state algorithm. The Level Detection Mode determines how input levels are calculated by the compressor. Adjusting the level detection mode will alter the level that is considered by the threshold, which will affect when or how often the input level will trigger compression. The Compressor includes two level detection modes: Peak and RMS. Peak: Determines input level to the compressor using instantaneous peak levels of the incoming signal. RMS (Root Mean Square): Determines input level to the compressor by averaging levels of the incoming signal. Determines the signal level at which the compressor begins processing. When the input level exceeds the threshold level, the compressor will be triggered. Signals that exceed the threshold level will be reduced according to the Ratio. The attack phase of the compressor begins when the input level exceeds the threshold level. The release phase of the compressor begins when the input level falls below the threshold level. Click and drag the Threshold slider handle up (to increase the Threshold) or down (to decrease the Threshold). Click on the Threshold value readout text and manually enter a value in the inline edit field. You can use the waveform displays as a visual guide when setting the threshold level for the compressor. Determines how much gain reduction will be applied to signals that exceed the threshold level. When ratio is set to a value of 1:1, no attenuation will be applied to signals that exceed the threshold. Ratio settings of 10:1 or greater allow the compressor to function as a limiter. Limiting ratios can be used to ensure that the output signal level does not exceed the threshold level. When Optical mode is selected, the Ratio control is fixed to 4:1. Adjusts the amount of time it takes for the compressor to apply gain reduction when the input signal exceeds the threshold. Attack time can be adjusted in increments of milliseconds (ms). 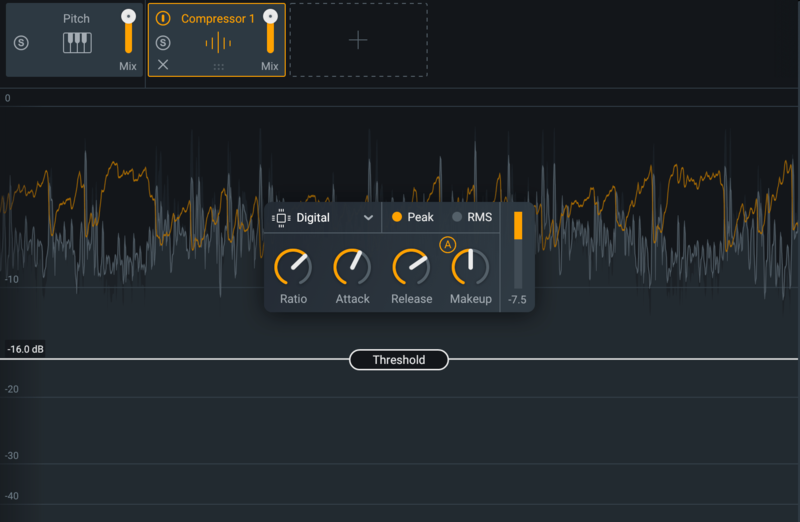 Adjusts the amount of time it takes for the compressor to stop processing when the input signal falls below the threshold. Release time can be adjusted in increments of milliseconds (ms) and are typically longer than attack times. Determines the amount of static gain applied to the output signal after compression. Automatically adjusts the gain of the compressed signal in order to match the level of the input signal. The module chain features common controls for each module, including: Bypass, Solo, Remove, Reorder, and Wet/Dry Mix. To learn more about the module chain and other global controls in Nectar 3, visit the Global Controls chapter. The scrolling waveform meters display the amplitude of the input (uncompressed) and output (compressed) signals over time. The meters scroll from right to left, with the most recent information on the right. The compressed output signal waveform is displayed in light grey, in front of the input signal waveform. The uncompressed input signal waveform is displayed in dark grey, behind the output signal waveform. When the signal is being compressed, the gain reduction applied to the output signal can be observed in the difference between the two waveforms. Auto gain adjusts the level of the compressed signal to compensate for any level difference between the uncompressed and compressed signals. The gain change introduced by auto gain is reflected in the output waveform, which may make it more difficult to differentiate between the input and output waveforms. The gain reduction trace meter can be useful for monitoring gain reduction over time when auto gain is enabled. The yellow trace line indicates the gain reduction applied by the compressor over time. The trace can be used to monitor the response times (attack and release phases) and gain reduction applied over time. Displays the current average amount of gain reduction applied to the signal. This meter displays gain reduction in decibels (dB).